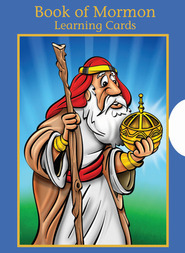 Help your children learn the basic truths of a testimony! Based on the true experience of Susan L. Warner, former counselor in the Primary general presidency, this children's picture book tells the story of a girl who learns from her father what a testimony is. To help her understand how to express her testimony, her father uses his hand to teach her the five parts of a testimony in a way she can remember. 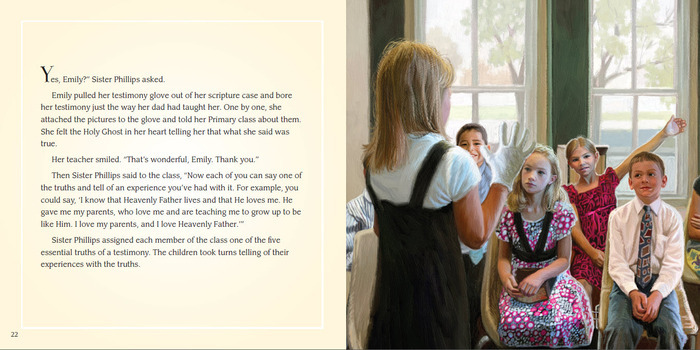 Along with the story, the book invites young Latter-day Saints to practice sharing their testimonies using the enclosed glove with pictures that attach to the end of each finger. The glove represents the Holy Ghost. There are pictures representing Heavenly Father, Jesus Christ, Joseph Smith and the Book of Mormon, the temple, and our current prophet, President Thomas S. Monson. *Royalties from the sale of this book assist in providing testimony gloves to children in developing countries. A glove is included with every book. Deseret News article about The Testimony Glove by Christine Rappleye (Click Here) If you need additional gloves Click Here. Kristen McMain Oaks has spent much of her life teaching. She earned a bachelor's degree in English, a master's degree in special education (both from the University of Utah), and a doctorate degree in curriculum and instruction from Brigham Young University. She was a former educational consultant in the publishing industry, instructing teachers and supervisors both nationally and internationally. She was also a Visiting Assistant Professor at BYU and served a full-time mission to Japan. After marrying Elder Dallin H. Oaks, she taught and trained auxiliaries in the Philippines for two years while he served as Area President. She currently serves on the board of trustees of the Deseret International Foundation and the Primary Children's Hospital and recently authored the book, A Single Voice. In addition to her love of teaching, she loves being a wife, mother, and grandmother. She and her husband reside in Utah. I LOVE THIS NEW Glove !!! Oh, new and improved glove ! Love this book ! This is so much better ! This is so great for my primary class! It is such a good missionary tool ! We have needed a book like this for so long. Loved the book and shared it in Primary. Deseret Book readily provided me with new finger tabs that are much better quality. All I had to do was ask and they had them in the store at the counter. This Book and Glove provided a very easy way to teach a very grown up concept to small children. They felt very empowered with the new knowledge and were excited to share it with their families. This will be a great Christmas gift with eternal impact. Wow!! I love this idea/book! At last, a focused and hands-on approach to help children understand a testimony. (Maybe more adults should read the book and take lessons!) I used the activity in Primary and the children--all ages--loved it. They wanted to stand and share their testimonies immediately. Wish they would use this book in Relief Society and Priesthood meetings, too. Taught in story form with beautiful illustrations, and perfect for parents of young families, or for teachers who want to teach this important concept to their classes, The Testimony Glove is an important addition to the gospel library of any home with young children. A hard back book with coil binding for easy sharing with a class or FHE, and thick pages for durability. It is beautifully illustrated by Dan Burr, and even contains a bonus white glove to use as a visual aid while teaching, re-teaching, and reminding. Additional white gloves are also available for individual children in families or classrooms. I looked forward to sharing this as a Family Home Evening, but ended up disappointed. 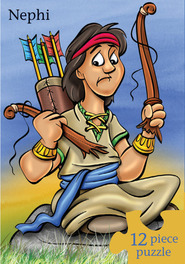 The story was difficult for the younger children to follow and read more like a journal entry than a children's story. The quality of the glove was poor at best. The velcro on the glove detached from the glue before we could even use it. I attempted to hot glue the pieces back on, but it was a very temporary fix. Great idea but lacked quality execution. Purchased 2 books, one for my parents who are serving a mission and one for our personal library. Before sending in the mail, I did a test drive of the glove. The glue that attaches the velcro to the glove immediately came off each finger. Ended up returning both books. A bit disappointed. A little back-handed, but it works! Pros: I purchased one of these for my lovely daughter who was having trouble saying what we know is true. She is still not sure what she believes, but at least she remembers what she is told to with this glove. Cons: It's kind of hard to pick things up once all the pictures are attached to the fingers.